Saturday, March 7, 2009 was a pretty memorable day for me. You wouldn’t believe me when I say it, but in the morning, I helped clean up the streets of Historic Filipinotown with boxing champ Manny Pacquiao, and in the evening I went on a bike ride with Tour de France champ Lance Armstrong (…with a few hundred others). But somewhere in between, I attended an event called the L.A. Bike Summit at Trade Tech College in Downtown. It was a workshop discussing bike culture, infrastructure and policy issues that gathered anybody who was everybody in the local bicycling/sustainability/mobility/environmental/urbanism scene – over 300 such folks. CicLAvia organizers Bobby Gadda (center left, standing) and Adonia Lugo (center right) discuss CicLAvia to attendees of the L.A. Bike Summit on March 7. 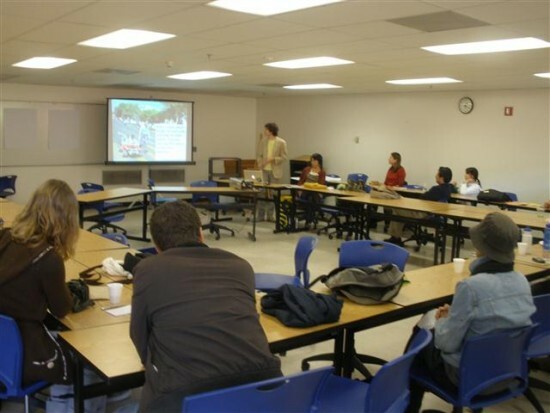 2009 at L.A. Trade Tech College. One of the sessions I attended was entitled, “A Ciclovia For Los Angeles.” The speakers, Adonia Lugo and Bobby Gadda, talked about a weekly car-free event in Bogota, Colombia called Ciclovia. It takes place on Sunday mornings, and a number of streets are closed to cars and open to bicycles, pedestrians, joggers, people walking dogs, any non-motorized mobility use. Unlike a total closed street, though, there were “permeable” intersections where cars are able to cross. Surely such an event would take years to plan. After the session I asked them what kind of timeline they had, they didn’t really have one, but were hoping for September (this was 2009). I offered to have the neighborhood council help out, telling them that the East Hollywood NC was the first such entity to endorse the Cyclists’ Bill of Rights in 2008. But they had already heard of our exploits. We exchanged contact information and Gadda emailed me a couple days later. Later in the year, Gadda emailed me again, informing me they were shooting for “Spring of next year ” for CicLAvia. They wanted to enlist the support of neighborhood councils and other community groups. I met with Gadda and Lugo in the fall of 2009 at LA Eco-Village and we sort of brainstormed possible avenues of outreach. I really didn’t know how far along in the process they were. But they wanted to come do a presentation to the EHNC. I had them come to the Outreach Committee on November 9, which the committee passed, and Gadda, Lugo and Stephen Villavaso made a presentation at the EHNC Monthly Governing Board Meeting Agenda on November 16, of which we unanimously voted to endorse. We became, again, the first neighborhood council in the City to support this. At the time, it was envisioned to take place in Spring 2010, and the EHNC was interested in having it coincide with our ArtCycle festival. The CicLAvia route had undergone several versions and revisions. Originally it was envisioned to be a circular route, reaching varous communities along the way, with each community hosting an event of sorts (street festival, farmer’s market, etc). Then it got scaled down into an short East Hollywood – Silver Lake route, with the idea of starting small and gradually growing the route over time. In any event, big or small, East Hollywood would be part of it. The cicLAvia folks are meeting with the mayor’s office this week – apparently the mayor has actually tasked staff to make this happen – exciting! Hopefully this means we can move forward with the plans for a ciclavia in March in East Hollywood. This means we should start thinking about doing the planning meeting we were talking about. We should have a meeting with local stakeholders, just people who live in EHNC, to help us figure out the best route. We can get the materials and programming together, we would just need help with a location in EHNC and outreach to get people to show up. What do you think? Getting Mayor Villaraigosa’s support was the big coup for the CicLAvia crew. Perhaps it was a way for the mayor to mend his tarnished image in the City. But if it works, it works, right? Well, Spring 2010 came and went, but that didn’t hinder the CicLAvia process from forging on. Some months later I heard that it would happen in September to coincide with Park[ing] Day L.A.. Then that got moved again. On Saturday, July 17, Mayor Villaraigosa rode his bike on the Venice Blvd. bike lane in Mid-City and suffered an accident trying to avoid a swerving taxi cab. He injured his elbow and spent the next couple of weeks recovering, wearing a sling on his arm. Richard Riordan, one of Villaraigosa’s predecessors in City Hall in the 1990s, was known as the “Cycling Mayor” for his penchant for mountain biking in the Santa Monica Mountains and participating in the annual L.A. Marathon Bike Tour. But Villaraigosa, who chose to ride his bike on our City’s streets, instantly became an unexpected urban cycling martyr of sorts. Many cycling activists probably thought that was the best thing to happen to the bike community. There was no turning back now. The mayor has now become one of us. Finally, I saw websites, posters and fliers with a linear, 7.5 mile East Hollywood-to-Boyle Heights route and the 10-10-10 date emblazoned on it. 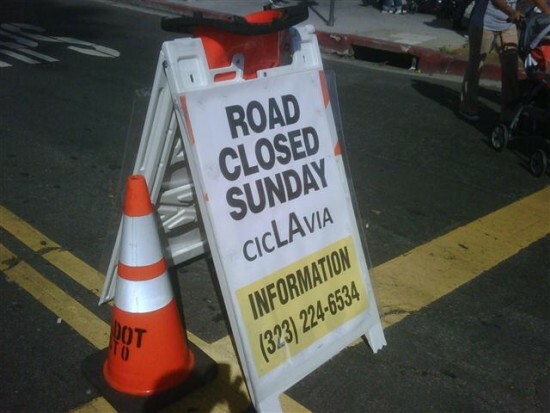 According to Joe Linton, another CicLAvia organizer, the official date of CicLAvia had been changed about three times, but unofficially, the date had been shifted around about 10 times. If the 10th time is the charm, so be it, for an event on 10/10/10 starting at 10 a.m. What was first presented as a nearly-pie-in-the-sky concept has now become reality. Much props to Gadda, Lugo, Linton, Villavaso and the rest of the CicLAvia crew for the initiative, hard work and persistence in making it happen.